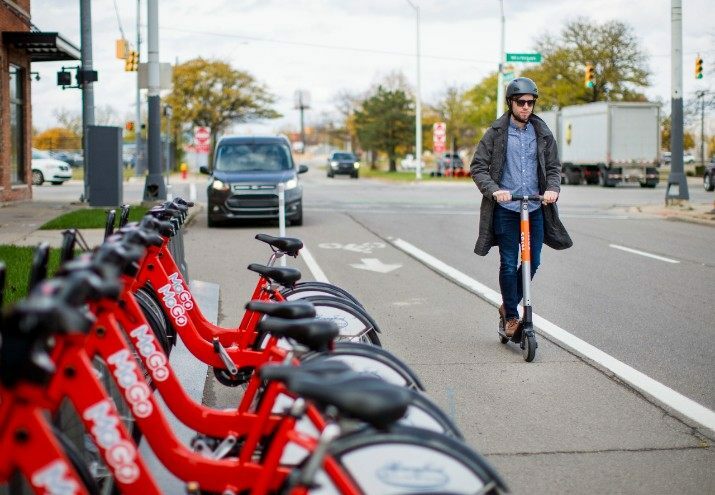 To better manage the deployment of “micro-mobility” transportation options such as scooters, three cities – Charlotte, NC; Detroit; and Omaha, NE – joined together with data analytics firm Passport to launch a joint pilot project on March 19 that aims to “maintain visibility and control over scooter deployments” as well as better manage curb space. He said this joint pilot program will apply parking principles, data analysis, and a software platform to charge for scooter parking in order to balance the supply, demand, and distribution of scooters in all three cities. Instead of capping scooter volumes or imposing flat fees, Youakim noted the program’s “methodology and technology” should allow each city to “incentivize behavior” by charging for curb space fairly across all modes of mobility. “Just as cities charge cars to park at the curb, they can apply an existing digital parking infrastructure for scooters,” he explained. Youakim pointed out that Passport has invested $5 million to help cities build the digital infrastructure necessary to coordinate complex urban transportation ecosystems and keep pace with technological innovation, allowing them to “more effectively work with private entities” in order to “quickly integrate new services” into their transportation networks.